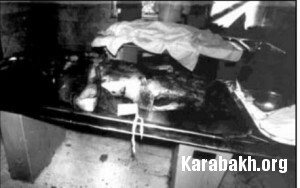 Armenian terrorist and extremist groups committed acts of violence against Azerbaijani civilians during 1989-1994 in the occupied Nagorno Karabakh and surrounding districts of Azerbaijan. Passenger bus, moving on the Tbilisi-Baku itinerary was blown up. As a result, 5 men died and 25 got wounded. 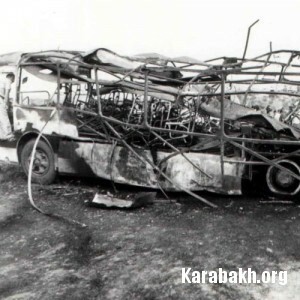 On the southern outskirt of the Khankendi town of the Republic of Azerbaijan, the Armenian terrorists blew up a car bridge on the Khelfalichay River. A criminal A.A.Abramian was sentenced by the Supreme Court of the Republic of Azerbaijan to 15 years of imprisonment with expropriation. 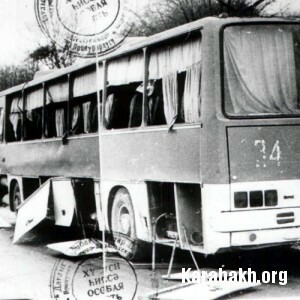 On the 105th kilometer of the Yevlax-Lachin highway, a line bus moving from Shusha to Baku was blown up. As a result of this terrorist act, 13 persons were wounded. A car caravan loaded with the goods of national economy escorted by detachment was attacked between the settlements of Oktavan and Jiraktar in the Agdere district of the Nagorno-Karabakh region of Azerbaijan. 3 persons were killed, 23 wounded. 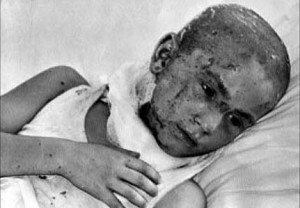 Criminal A.Ayrian was sentenced to extreme penalty with expropriation by the Supreme Court of the Republic of Azerbaijan on July 12, 1992. 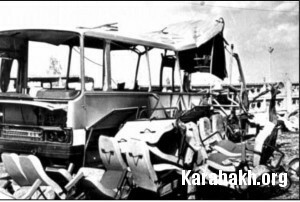 As a result of an explosion of a passenger bus moving on the itinerary of Tbilisi-Aghdam 20 persons were killed, 30 wounded. This criminal group also planned to organize explosion on the bus Aghdam-Tbilisi. On June 17, 1991, the group was arrested, its leader A.Avanesian was sentenced to the extreme penalty, a member of the group M.Tatevosian - to 15 years of imprisonment. A terrorist group, headed by S.Babayan and A.Ayrumanyan, killed 3 persons on a span between the Jamilli and Kosalar stations of the Asgeran district of the Nagorno-Karabakh region of Azerbaijan. 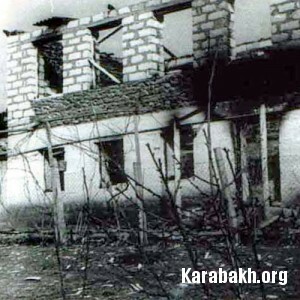 The Armenian terrorists blew up the broadcasting center in Khankendi. No victims were recorded. A reporter of the newspaper "Molodyoj Azerbaydjana" ("Azerbaijani Youth") S.Askerova, militaries - lieutenant colonel S.Larionov, major I.Ivanov, sergant I.Goek were killed on the 15th kilometer of the road from Lachin to Shusha. The Supreme Court of the Republic of Azerbaijan sentenced criminals A.Mkrtchian, G.Petrosian, A.Mangasarian, G.G.Arutyunian and G.M.Arutyunian to be shot and other members of the terrorist group to different periods of imprisonment. In Khankendi V.Bagmanian, A.Antonian and S.Bagmanian made an attempt upon the life of major-general V.Kovalyov, chief of the Office of Internal Affairs of the Nagorno-Karabakh Autonomous Region. Near the Drmbon settlement of the Agdere district of the Nagorno-Karabakh region of Azerbaijan a group of terrorists, led by V.Galayan, committed an armed attack on autocade, moving to Kelbadjar. A driver of gasoline truck was killed. 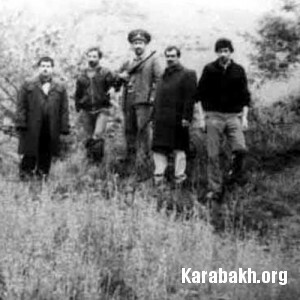 A.Bagmanian, S.Babayan, A.Abramyan and others killed head of the "Khodjali" airport. A terrorist act was committed against deputy head of the office of internal forces on the Northern and Southern Caucasus colonel V.Blakhotin in Rostov-on-Don, Russia. The Court Board of the Rostov region sentenced criminals to different terms of imprisonment: A.Bagmanian and A.Antonian - to 15 years, S.Bagmanian - 12 years, K.Akopyan - 4 years, K.Yegityan - 2 years and 9 months. As a result of an armed attack on motor-car, the Armenian terrorists headed by G.Sarkisian in the Khojavend district of the Nagorno-Karabakh region of Azerbaijan, near the Amaras Church 3 police officers were killed. The same group blew up the bridge between Askeran and Aghdam. The Armenian militants made an attempt upon Vladimir Polyanichko, one of the members of the Organizational Committee of the Republic of Azerbaijan on the Nagorno-Karabakh Autonomous Region. 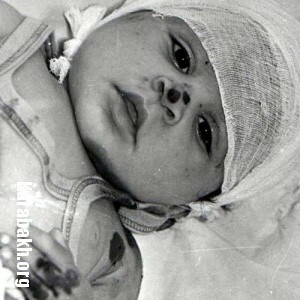 On August 1, 1993, he was murdered as a result of a terrorist act in the Northern Ossetia. The Moscow-Baku passenger train was blown up near the railway station of Khasavyurt, Dagestan, Russia. 11 people were killed and 22 wounded. A group of the Armenian terrorists made an attack on the Garadaghli settlement of the Martuni district of the Nagorno-Karabakh region of Azerbaijan. 6 people out of the peaceful population were killed. 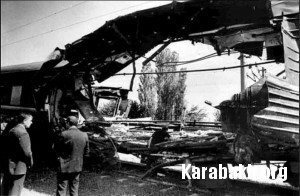 On the territory of Dagestan the Armenian militants blew up the Moscow-Baku train, as a result of which 16 people were killed and 20 wounded. Khomich, major of the internal forces of the Ministry of Internal Affairs of the USSR was murdered on the highway Khankendi-Shusha. 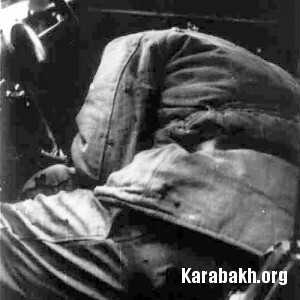 "Mi-8" helicopter, with a group of eminent statesmen, political and military figures of Azerbaijan, Kazakhstan, Russia, as well as other officials and journalists on the board, was shot down by the Armenian terrorists over the Garakend settlement of the Khodjavend district of the Nagorno-Karabakh region of Azerbaijan. All passengers and crew died. The Krasnovodsk (Turkmenbashi)-Baku passenger see ferry was blown up. 25 persons died and 88 were wounded. 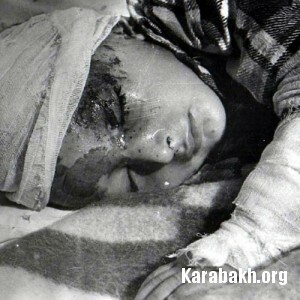 A civilian helicopter, flying on the itinerary of Aghdam-Shusha, was shot down by the Armenian terrorists near Shusha. From 41 passengers on the board, mainly consisted of women and children, 3 were killed. The Kislovodsk-Baku passenger train was blown up not far from the Gudermes station, Chechnya, Russia. 11 were killed, 18 wounded. A passenger railroad car, standing on sidings, was blown up in the railway station in Baku. No victims were recorded. 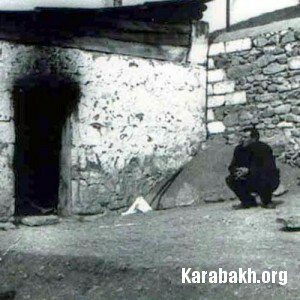 Criminal I.Khatkovskiy was sentenced to 8 years of imprisonment by the decision of the Supreme Court of the Republic of Azerbaijan on July 22 1994. The Kislovodsk-Baku passenger train was blown up in the railway station in Baku. As a result, 3 people died and more than 20 were wounded. A railroad car was blown up in the Khudat station. No victims were recorded. The Armenian terrorists shot down the "Hercules" aircraft of the Iranian Air Forces, with diplomats and their families on the board. As a result of the terrorist act, 34 people lost their lives. An electric train was blown up in the subway station of "the 20th of January" in Baku. 14 people were killed and 42 wounded. The Moscow-Baku passenger train was blown up in the railway station of "The lights of Dagestan" (Russia). As a result of the terrorist act 6 people were killed and 3 wounded. An electric train was blown up between the "The 28th of May" and "Gandjlik" stations of the Baku subway. As a result, 14 people died and 54 were wounded.